Without reliable port equipment, port activities can grind to a screeching halt. A material-handler or crane and all attachments should perform consistently month after month and year after year. While choosing the right equipment plays a major role in performance, maintenance is just as crucial to port success. Like other industries with the need for consistent turnaround rates, the shipping industry depends on equipment and trained operators to maximize uptime. Improper maintenance can significantly decrease the productivity rates projected during an operational assessment. For example, an unrepaired crack in a boom can turn into a major structural weakness and result in the collapse of the boom and loss of valuable cargo. If someone had identified and addressed the crack early on, they could have potentially saved thousands or hundreds of thousands of dollars in losses. Appropriate equipment maintenance decreases the risk of major work disruptions, but it can also improve operational efficiency. Equipment that works seamlessly day after day can handle large volumes of cargo, build trust among shippers, and generate more revenue for the port. Remember the filters. Like the filter on your air intake at home, equipment filters get gunky. When they are not clean, particulates and ineffective flow rates can reduce the efficacy of airflow and lubrication throughout the machine. Over time, the chain reaction that poor filtration causes can create permanent damage due to increased friction and heat on the metal components. Whether you run a small lawnmower or a Sennebogen 830 Crawler material-handler, change the filters regularly to protect the system and maintain consistent performance. In general, someone should inspect the filters per the equipment maintenance manual, or a minimum of every 500-1,000 hours of operation. Keep the oil clean, fresh, and full. Follow all recommended oil changing practices. Check oil levels in-between changes to identify any leaks that could escalate. Look for oil drips around the equipment and immediately inspect oil levels if you see puddles of rainbow-hued oil on the ground. Change the filters to ensure oil purity, and always use the recommended type of oil for the equipment. The wrong type of oil or not enough oil in any machine increases the likelihood of friction/heat-related damage, unnecessary noisiness, debris-related damage, and corrosion damage. Grease high-use parts daily. Lubrication appears twice on this list because it is so important. While oil improves lubrication inside the machine, equipment operators should grease exterior bearings, joints, and other moving parts for improved performance. Daily greasing will ensure each component in your piece of equipment is ready for action when needed. Damage from improper greasing practices is common and highly preventable. Check your equipment manual to locate daily grease points. Inspect equipment regularly. Conduct equipment inspections as recommended in an inspection or maintenance guide. Generally, guides recommend inspections after every 500 hours of operation. Look for cracks, structural damage, dents, exposed wires, and other issues that could turn into major maintenance headaches. In many cases, catching an issue early will reduce the cost of repairs. Some components will wear out faster than others. Manage your onsite inventory to plan and prepare for known component failures. With the right spare parts, your port can minimize downtime from an unexpected malfunction. While not exhaustive, this list covers some of the biggest maintenance issues port managers address on a routine basis. Overlooking routine maintenance activities can quickly snowball into a major performance issue. Most of the time, ports can conduct all maintenance and minor repairs in house. When an issue does call for outside help, use a brand-authorized service team. A general mechanic may not know the system in the same way as a brand-partnered service team, and using generic parts or service could void the terms of a warranty. 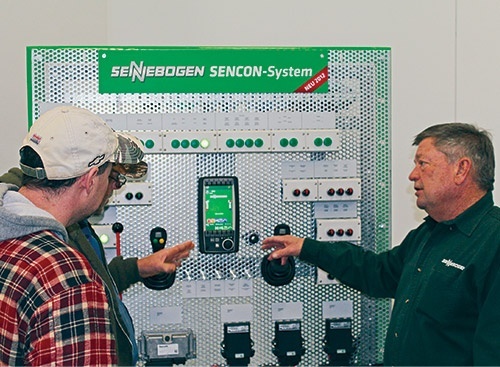 At Sennebogen, we strive to create value at every step of the equipment lifecycle. Our company engineers port equipment to last with standard maintenance practices. With straightforward, energy-efficient, and easy-to-service designs, we strive to give our customers equipment that will last a lifetime. We have a network of authorized service providers located throughout the world to help with non-routine repairs; and, equipment owners can access our machine documentation and spare part inventory through our online portal from anywhere in the world. When it comes to the impact of port maintenance on revenue streams, don’t take any chances. 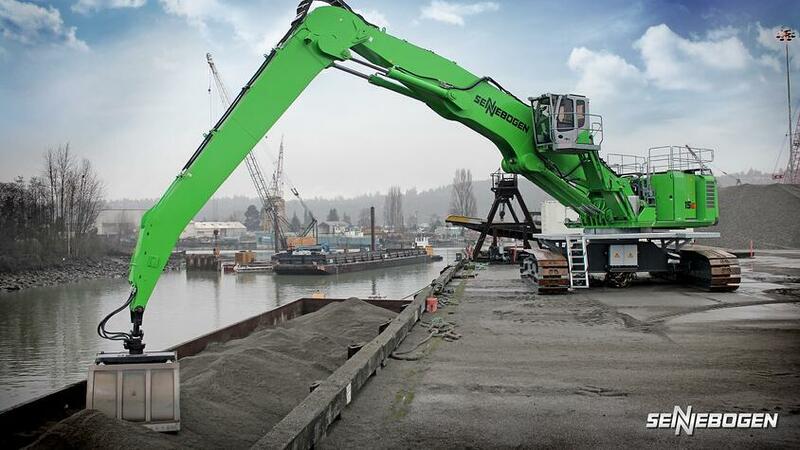 Partner with Sennebogen for all of your crane and material-handling needs.